Fired Oregon Commission for Black Affairs members Clifford Walker and Willie Woolfolk say they have been invited to hearings at the state capitol to "clear their names" – but as yet neither has been informed about exactly what they are supposed to have done to get the boot. In an email Monday, Walker told state officials he would not be attending the hearing. "Can you believe this?" Woolfolk said Friday. "It sure would be nice to know what I'm clearing my name from." A series of emails between the commissioners and the Oregon Advocacy Commission administrative staff, obtained by The Skanner News, shows that a power struggle between them brewed throughout this past spring. However it's unclear whether their conflicts had anything to do with the firings since the governor's office is refusing comment. Commissioners are not paid employees, they are volunteers appointed by the governor. The paid support employees tend to daily operations of the state's four advocacy commissions, for: women; Black affairs; Hispanic affairs; and Asian and Pacific Islander affairs. Walker and Woolfolk have served on the board for five years and four years, respectively. Walker is an Air Force veteran, retired entrepreneur and founder of the Portland-Mutare, Zimbabwe, Sister City Association. He is a longtime HIV/AIDS education activist. 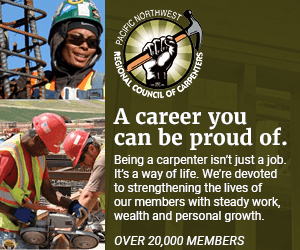 Woolfolk is a construction worker and 15 year member of the Construction & General Laborers Union of Southern Oregon. As of Friday morning, both men's photos and biographies had been scrubbed from the OCBA website, although two new commission members still have incomplete profiles. A look through the OCBA's minutes, posted online, show ongoing disagreements between Walker and Woolfolk, and the paid OAC administrative staff. On March 17, 2012, the minutes reflect that Baker had issue with "maintaining a professional workplace," including Woolfolk's "tone and manner." One the other side, Woolfolk's concerns, listed in the "Agenda Items for Discussion," included the timeliness of typing up the meeting minutes, action items and agendas relating to the board's work; the minutes show that OCBA Chair Isaac Dixon directed staff to work on a more effective process for "disseminating Action Alerts," and a 10-day timeline for producing the minutes. The Oregonian first broke the story late Thursday night that Walker and Woolfolk had been fired by Gov. Kitzhaber, but that his office was not revealing why. "The funny thing is, the letter fired me – and then thanked me for my service," Walker said. "Why would you fire someone and then also thank them for their service?" Current Commissioner Lorraine Wilson called the firings "unprecedented," and expressed deep concern that Walker and Woolfolk were working on important initiatives on hate crime enforcement and racial disparities in contracting and hiring at the Oregon Department of Transportation, including how federal stimulus money was spent by ODOT. She said the two commissioners' work in pushing the state to speak out and take action on these issues appears to be in limbo. "I'm trying to understand what it is from the governor's actions – why he put himself out there like that," Wilson said. "These two commissioners have been working diligently." Kitzhaber's spokesman confirmed Friday that he could not comment on the case. Walker and Woolfolk told The Skanner News that they had each received a phone call Thursday from a state employee who said they could either quit or be fired; both confirmed that within an hour they received emailed termination notices.